I made up this works for my personal memory. One of my childhood friends was very good at painting. I particularly liked her watercolor painting which depicted a flower in a water glass. The Sun threw light from the upper right side to the left below; the sunray warped the flower stem in the glass. 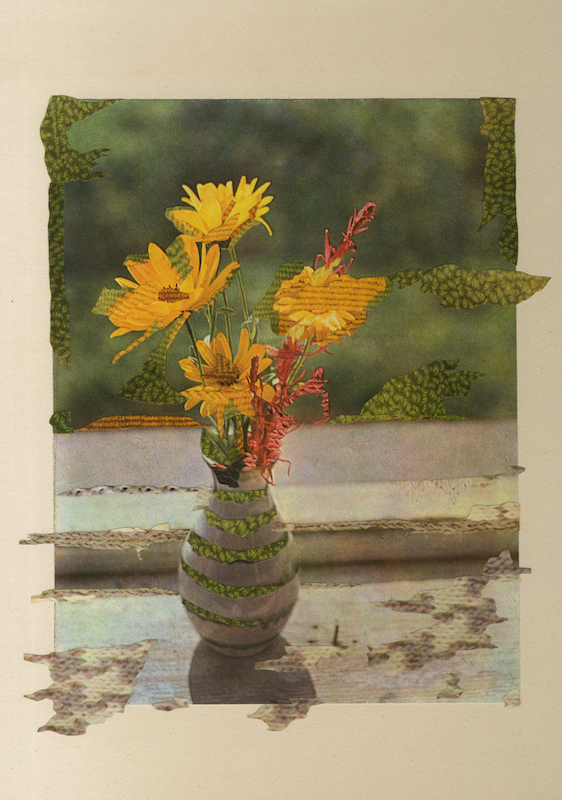 When I look at a photograph of a flower arranged in a vase in an old magazine, I get to remember her flower painting. Even though the object was just another, her painting had the distinctive depth. It was objective and delicate, and never be child-like. I supposed that her keen observation and devotion power for the objects would surely determine her later life, and felt uneasiness and somewhat admiration. Now, I eager to know what attracted me so much at that time. So, I make up this collage.